Britain would be welcomed into the Trans-Pacific Partnership trade deal with "open arms" after it leaves the EU, Japan's prime minister has said. 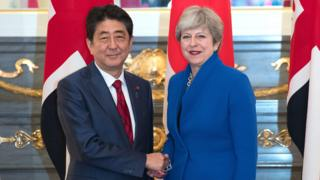 While the UK would lose its role as a gateway to Europe after Brexit, it would retain its "global strength", Shinzo Abe told the Financial Times. He also urged the UK and EU to use "wisdom" to avoid a no-deal scenario. The TPP is a trade agreement between 11 countries, including Japan, Canada, Australia and Malaysia. US President Donald Trump withdrew his country from the agreement last year, soon after entering the White House. Could the UK really join TPP? Mr Abe's comments have been welcomed by Brexit supporters, including international trade secretary Liam Fox, who argue Britain would be able to strike trade deals more easily outside the EU. The UK would only be able to join the bloc if it left the EU customs union and was able to set its own tariffs. In the interview Mr Abe also expressed concern about a no-deal scenario. "I hope that both sides can contribute their wisdom and at least avoid a so-called disorderly Brexit," he said. He argued a transition period was essential for Japanese firms, saying, "I truly hope that the negative impact of Brexit to the global economy, including Japanese businesses, will be minimised." Japan is a major investor in the UK, where more than 800 Japanese businesses employ more than 100,000 people. But in the run-up to Brexit several Japanese financial firms have said they intend to move their main EU bases away from London and electronics giant Panasonic has said it will move its European headquarters from the UK to Amsterdam. Talks on the terms of the UK's withdrawal and its future relations with the EU are entering a critical phase ahead of a summit of European leaders next week. On Wednesday, the EU is due to publish updated proposals for future co-operation as well as more details of its no-deal contingency plans but the BBC's Europe editor Katya Adler said these could now be delayed. Brussels, she added, was anxious not to do anything that could imperil the chance of an agreement by the middle of November and wanted to meet the UK's concerns without crossing their own red lines. The UK is also expected to update its own proposals for its so-called Northern Ireland backstop - an insurance policy intended to stop the return of physical infrastructure on the border with the Republic of Ireland. The BBC's political editor Laura Kuenssberg said this could involve an increase in "light touch" checks on products and goods away from the border until a more comprehensive solution was agreed. Media reports suggest Tory Brexiteers might be willing to accept such a temporary customs arrangement extending beyond the end of 2020 - when the UK-EU's proposed transition period will cease. Former Tory MP Stewart Jackson, who until July was an adviser to ex-Brexit secretary David Davis, said this had been their view for some time but also that Eurosceptics would not allow it to continue indefinitely. Irish border arrangements have proven a sticking point in negotiations. An alternative backstop proposed by the EU would see Northern Ireland effectively remain in the customs union and single market, while the rest of the UK shifted away from Brussels' rules. However, the prime minister has already said it would be unacceptable and it is strongly opposed by Northern Ireland's Democratic Unionist Party (DUP), on which Mrs May's government relies to secure a majority in Parliament. DUP leader Arlene Foster warned it would be "catastrophic" to create a barrier between Great Britain and Northern Ireland as she travelled for talks with the EU's chief Brexit negotiator Michel Barnier on Tuesday.